We’d love your help. 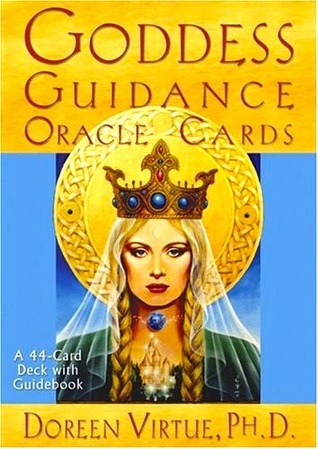 Let us know what’s wrong with this preview of Goddess Guidance Oracle Cards by Doreen Virtue. To ask other readers questions about Goddess Guidance Oracle Cards, please sign up. I love this deck. Firstly the feel of it is great. The cards are silky smooth and the guilded edge adds a little somethin'. The images are created by various artists and each of them express well the meaning/energy of each card. 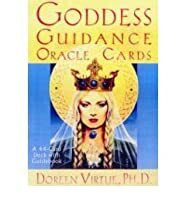 Doreen Virtue has offered in the little book a divination meaning/message and also some quick possible other meanings then a little about the goddess. It's a great deck for personal interpretation and also if you are wanting to familiarise yourself with different goddess I love this deck. Firstly the feel of it is great. The cards are silky smooth and the guilded edge adds a little somethin'. The images are created by various artists and each of them express well the meaning/energy of each card. Doreen Virtue has offered in the little book a divination meaning/message and also some quick possible other meanings then a little about the goddess. It's a great deck for personal interpretation and also if you are wanting to familiarise yourself with different goddesses. These are wonderful! Even without doing a reading, I felt better, more calm, just flipping through them. Have a cup of tea and enjoy! Love em, learning about the different Goddesses and helping myself and others along the way! Love these, they were given to me. So I'd say they found me. I have owned this deck for nearly ten years and do daily readings which are quite clear and offer great guidance. Easy to use. Highly recommend. I picked up this deck of cards because of the nice colour scheme and well drawn picture on the front. The cards themselves are nice, but some of the picture qualities for the goddesses make it feel cheap when I look at them. The font chosen for the card description is extremely plain and lacks in making me feel special when I read it. The fronts of the cards feel like it was designed on Microsoft word, which I wasn't expecting due to the packaging being very slick and nice. For that reason I am I picked up this deck of cards because of the nice colour scheme and well drawn picture on the front. The cards themselves are nice, but some of the picture qualities for the goddesses make it feel cheap when I look at them. The font chosen for the card description is extremely plain and lacks in making me feel special when I read it. The fronts of the cards feel like it was designed on Microsoft word, which I wasn't expecting due to the packaging being very slick and nice. I love these cards SO much. They are beautifully designed and the messages that are written on them keep inspiring me day after day! I've been using this deck for a few days now and absolutely love it. Beautiful pictures, detailed descriptions in the little booklet and overall these cards are very positive, encouraging and empowering. I like to use it when I don't feel "ready" for my Lenormand cards or any deck with "negative" cards in it and need a little "coddled." Edit: Yemanya - I'd never heard that version of Yemaya/Yemoja. Couldn't find anything reliable online about "Yemanya" actually being correct. Another excellent, positive oracle deck with a useful, concise guidebook. Those who are new to cartomancy need not fear using this deck; the basic messages are printed directly on each card. More detailed information, including the cultural background of each portrayed goddess, is found in the guidebook. The book also gives basic information on doing readings, including some optional "spreads" to be used. Well done! I love this deck! :) Some of Doreen's decks can be hit or miss. I feel this is a worthy investment if you dig goddesses. This deck is not artistically astute, nor is it filled with in depth goddess wisdom. It's more light hearted....nothing too serious or overtly evocative. I have found much delight with these Oracle cards. I prefer a quick one card draw with this deck. The message is always enough to keep me thoughtful and focused on the intention throughout my day. I absolutely love this oracle deck! As the name suggests, it is based on Goddesses. From Celtic to Greek Goddesses, this is a great addition to any divination collection! I highly recommend it! This is my all time favourite deck. Beautiful artwork and very uplifting messages. The cards are very lively and easily recognised. 2nd reading. An inspirational set of oracle cards with lovely art work, more focused on affirmations than divination.